B&B Scacciapensieri is a luxury eco Abruzzo B&B in Teramo’s foothills whose stunning rooms don’t fail to impress. 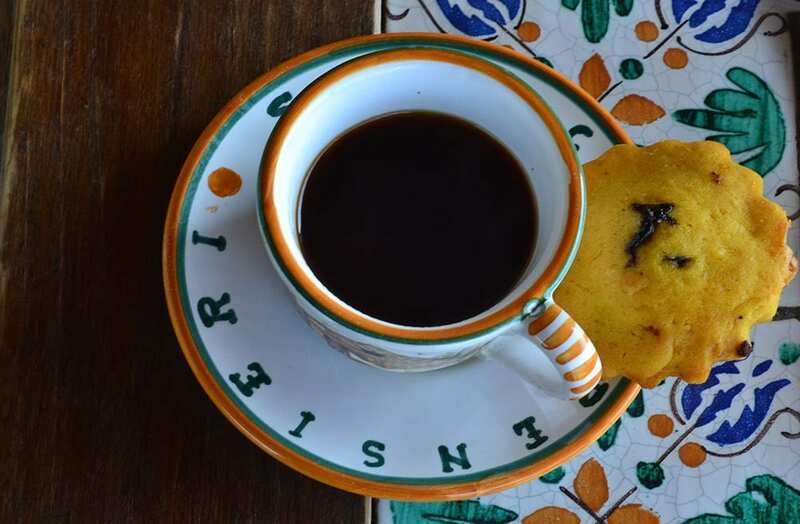 Their incredible authentic organic breakfasts (dare I say one of the best I’ve had in Abruzzo) and some of the most magical panoramas of the northern ridge of the Gran Sasso mountains provide a tranquil space to catch your breath whilst sampling Abruzzo’s culinary heritage. I love people who respect Abruzzo’s mountains and hosts Bruno and Lorena certainly do that. The B&B has been beautifully designed for optimum energy efficiency using reclaimed local stone and brick, and it utilises planet friendly phytoremediation for waste recycling. All the foods served are organic and either grown & made on the premises or locally sourced. In the bathroom, the toiletries & beauty products are Weleda so organic and paraben free. Bruno used to work for the EU and has fantastic English, French & German and his partner Lorena who is a local architect also speaks English and German for non-Italian speakers. This is a big advantage as this part of Italy isn’t particularly well documented in travel guides so having a host that speaks multiple languages ensures you get the most locally from your experience. Breakfast changes daily and is a superb sweet & savoury meze feast for the eyes and tummy that is served on the veranda in summer. If you are a couple you can have privacy and sit on the top room’s balcony, both areas look out onto the Corno Grande which is Italy’s highest mountain outside of those in the Alps. I loved the piquant & delicate leaf wild spinach (orapi) that was used as a garnish on the dishes, some had been picked whilst foraging high in the mountains and Bruno now grows it and proves that spinach didn’t start life as tasteless in a muddy way! We enjoyed a fantastically tasty duck omelette made with fresh eggs from their own little Jemima Puddle-Duck who quacks back when you chat to her and their incredibly moreish home-made salami, prosciutto and delicious squishy sausages that are preserved under oil were a hit with everyone in our group especially our little boy. More little plates that you may get to sample are fresh sheeps’ ricotta drizzled with home-made chocolate sauce and local hazelnuts, yogurt wth fresh fruit and pastries that include seductive Bocconotti Montoriesi stuffed with grape jam or pistacchio cream and the alway moist and flavoursome Mostaccioli. 4 beautiful and spacious double ensuite rooms with incredibly comfortable beds. Solar powered al-fresco jacuzzi, perfect for those that want a view whilst they relax with a burst of bubbles. An indoor jacuzzi is available for those who visit in the winter or prefer more privacy. Although there is no wi-fi in the rooms, there is in the communal interior space with a good connection and on the veranda where the stunning views are a delight. Telescope – this area is a wonderful place to watch the skies at night as there is little light pollution. Azzinano – Hometown to the famous national artist Annunziata Scipione whose work inspires a new mural to be painted each year in the town that documents life in abruzzo. The Gran Sasso Park – incredible walks and climbs ask Bruno as he does both and he can advise according to your level. I would actually recommend eating in one night as the owner’s son Mirko is a fully qualified chef who trained in France. Enjoy a superb medley of local flavours that have been prepared with such attention to detail and presentation it reinforces the fact that this is no ordinary Abruzzo B&B. La Casa Gialla Pizzeria is always excellent at the bottom of the hill and recently the feature of Vincenzo’s Plate showing just how Italians eat pizza! Make use of Bruno’s encyclopedic and passionate knowledge of the area adn that he is a keen walker. He is an expert on local wines, we checked out the Giulianova Faraone winery on his recommendation and were so very impressed we have been telling friends ever since who also now visit! Double room with breakfast is €90 per night discounted when staying for more than 1 night. Love learning of new places especially when my favs are full.